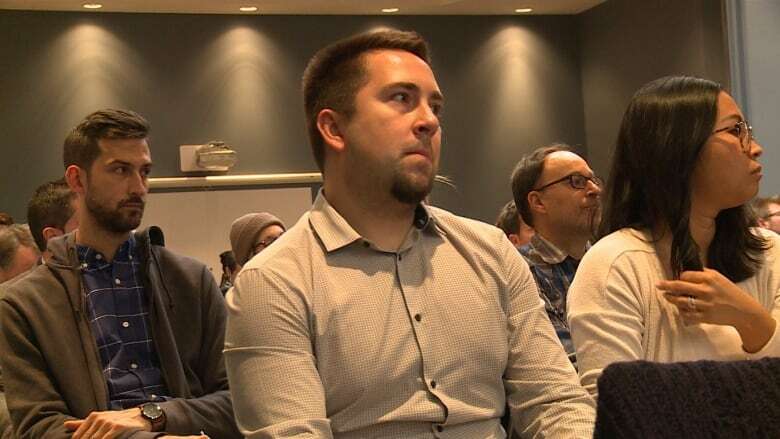 After closing a stretch of Camillien-Houde Way for five months to through traffic, city representatives faced a tough crowd at Thursday night's public consultation looking into how the pilot project went. After closing a stretch of Camillien-Houde Way for five months to through traffic, the city of Montreal is now facing the public to gather opinions on how it went — and the first session Thursday night was tense. "It simply removed one of my favourite things in this city," said Eric LeMoyne, who lives in the Côte-des-Neiges–Notre-Dame-de-Grâce borough. "Especially when I'm bringing people from out of town — taking them through the mountain." In June, a 550-metre stretch of Camillien-Houde Way, which turns into Remembrance Road as it nears Côte-des-Neiges Road, was closed off to car traffic. Only cyclists, city, school and tourist buses, emergency vehicles and funeral processions were allowed to drive through that stretch, which re-opened in November. Montreal is now holding public meetings to decide if the closure will become permanent. It said the project wasn't perfect, but that it was a success overall and fostered a more peaceful atmosphere on the mountain. LeMoyne said he felt as if the city had already made up its mind about the project. Another attendee, Leslye Lang, said she was disappointed that only 10,000 people responded to the online call for citizens to comment on it. Up until October, the Office de consultation publique de Montréal (OCPM) collected information online from citizens about how the closure was going. "It's a very important artery and there was very little forethought," Lang said about the project. The next session where citizens can air their opinions will take place November 28. The OCPM will then submit its report in the winter of 2019, the city said. The controversial decision to close the road came after 18-year-old cyclist Clément Ouimet died when he collided with an SUV that pulled an illegal U-turn on Camillien-Houde last year. At the time, the city estimated about 10,000 cars were circulating on it every day. Is Camillien-Houde Way really the shortcut it's cracked up to be? Mount Royal's road-blocking pilot project comes to an end. Will it be made permanent?